Written by experienced Aussie youth pastor Tim Hawkins, this book helps 21st century teens discover the amazing things God wants to do with their heart. Tim's clear biblical teaching has a proven track record of reaching young people and helping them mature in Christian discipleship. 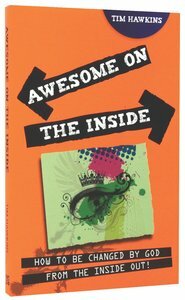 About "Awesome on the Inside (2nd Edition)"
How to be changed by God from the inside out. Customer Reviews For "Awesome on the Inside (2nd Edition)"
We live in a society where appearance is everything. And it can be so hard to be a Christian teen, trying to do the right thing for God, but also "fit in". This book became a guideline for me and taught me the real definition of the word "awesome". And how what is on the inside, is not only more important than the outside but also how what is on the inside, will eventually come out on the outside. I recommend this book to any teen who truly wants to be used by God.